Homeowners usually resort to add-ons or extensions on their homes, but what if adding more livable space could be easier than that? 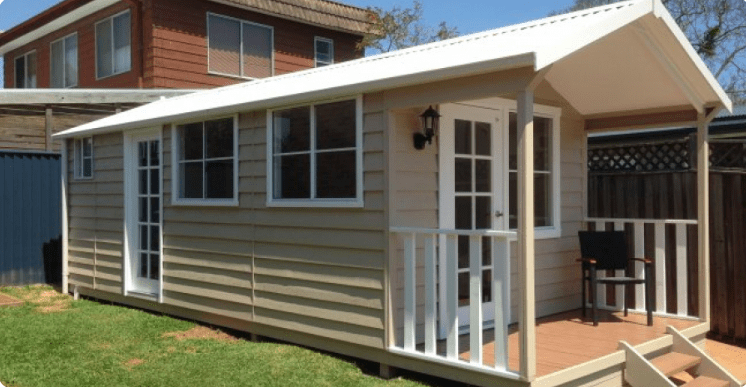 Melwood Cabanas & Garden Rooms offers beautiful small structures ranging from garden sheds to spacious small spaces that can be used as cabins, guest houses and more. The company creates their completely prefabricated buildings in Sydney, Australia and they deliver all over the country. After the home has been delivered it usually won’t take more than a day to set up. Once set up, all of their buildings also have a 10 year warranty that covers both their materials and work. All of the small structures include pre-fitted insulation in the walls and the roof which means the building is protected from the elements. The nice thing about these prefab tiny structures is that they are adapted to suit your property, lifestyle and needs. They can even be delivered into tight spaces and placed pretty much anywhere on your property. They offer a few different options to suit a variety of needs including their eSpace Garden Rooms, Mod Cabanas, Porch Cabanas, Veranda Cabanas, Workshops and Work Sheds. Then, each of the designs comes in a variety of different sizes and prices. If you see a floor plan or model you love, but you wish it had more windows or maybe French doors, they can accommodate that in your designs. The Garden Room models are designed for both recreational and living usage. The cabins can be upgraded to suit building requirements and codes for full-time living so you can live in a tiny house if you like. These also make great rental units or guest homes on your property. When you are considering what type and size of building you’d like to place on your property they can even send one of their estimators out to measure the property to assist you in making your choice. You can also visit one of their Display Centers nearest to you and see in person the size of the units so you can get a better idea of how much space they’ll take up. Once you’ve chosen your design and the plans are finalized, the company will create your prefab cabin package, then they can deliver it and set it up if need be. You will then have a structure that needs to be finished on the inside with ship lap interior siding or drywall. The floors will need to have flooring installed as well. All of the structures come with tongue and groove ply flooring and all of the wood is treated for termites to protect your small structure for 40 years. Their floor system use a sturdy piers that sit on a concrete footing which is finished before hand. So property owners must have their foundation ready to go before the contractors come to assemble the small structure. As you can see, there are a bunch of great designs to choose from in their collection and there’s really something for everyone. They can be used for many purposes and one of their Espace Garden Room 2000 models was actually used as a Bat Sanctuary for treating sick and injured bats. Other customers have turned their garden rooms or cabanas into retreats on their property, for a place to go to have some peace and quiet. Others have made them into home offices or art studios. There are even some garden rooms that have been turned into backyard pubs and lounges so you can enjoy some drinks in the comfort of your own space with that lounge feel. What would you use one of these structures for?